T-Mobile is currently battling Verizon in the #BallBusterChallenge to see whose network is superior, but today a new report shows that T-Mo’s network is faster than its competition. OpenSignal today published its latest State of Mobile Networks: USA report, and in it, T-Mobile wins out for fastest 4G LTE download speeds. T-Mo’s average speed for the testing came out to 12.26Mbps, edging out Verizon and its average speed of 11.98Mbps. T-Mobile also had the fastest speeds in the most metro areas, with T-Mo taking Boston, Dallas, New York, and Philadelphia, while Verizon had the fastest speeds in Chicago, Los Angeles, and Miami. The two carriers tied in Atlanta, San Francisco, and Washington, and there was a four-way tie between all the carriers in Houston. LTE speed isn’t the only area of network performance that T-Mobile won. T-Mo also beat out its competition in 3G download speeds, boasting an average of 3.48Mbps while second place AT&T put up an average 3G speed of 2.22Mbps. Verizon and Sprint’s 3G coverage were far behind, putting up average speeds of 0.66Mbps and 0.64Mbps, respectively. Finally, OpenSignal’s report shows T-Mobile winning for lowest 3G latency. Sprint claimed victory in the 4G latency testing. The OpenSignal report was put together using data from 181,927 people using the OpenSignal app to measure network performance. The data in the report was gathered between October 1 and December 31, 2015. This report is another win for T-Mobile, with T-Mo winning out on download speeds and winning the most categories overall. OpenSignal also says that T-Mobile is also starting to deliver on the coverage promises that John Legere and T-Mo have made. In its testing, OpenSignal found that T-Mobile had an LTE time coverage of 81 percent — that metric measures the amount of time that users have coverage — putting it about one percentage point away from AT&T and getting close to Verizon and its 87 percent time coverage rating. T-Mobile has been rolling out Extended Range LTE to boost its coverage, and today’s report shows that T-Mo’s work is paying off. To check out the full OpenSignal report for yourself, hit up the link below. don’t know where Tmobile gets their information but my area Tmo is in last by far ! Oh, sorry…didn’t know everywhere in the country is contained within “your area”. Open your mind to the possibility of success outside of you. In what categories, signal, speed or what? maybe read the report? it’ll likely answer your questions. This isn’t T-Mobile’s information, it’s information from T-Mobile users’ real-world experiences and aggregated by OpenSignal. That is why if you live in a tmobile area then it is worth it to try them out. If not then pick verizon. No need to start fighting or what service is better because everyone lives in different areas and has different coverage where they live and travel. Don’t come in here with your rationale and reasonable tones!!! Even if a given carrier is really strong in your area, you could still have issues. Verizon shows having their strongest signal in my neighborhood, but for some reason, at my house, the signal was really bad (1 bar usually, sometimes 2, and many many dropped calls). Contacted V, they tested the signal strength around our house and found it was essentially a hole in the coverage, so they let us out of our contract and waived our ETF’s (which I thought was pretty cool of them to do). Been with T-Mo since then and we don’t have the same issues. Agreed. I had Verizon when I worked for them as a contractor and also had Sprint. My wife still has Sprint and I have my t-mobile line and t-mobile is always the better of all of them. I had att for about 2 weeks, couldn’t stand them. Their lte speeds in my area stayed around 11mbps. Completely agree with you. I tell all my friends if they live in major cities to definitely go with T-Mobile. But what about people who go out, walk, drive, visit friends, visit family members, go to work, go places and travel from time to time; what do you say to them? I’d say to them, “stay away from VINN”. Could it be because it’s being overloaded by the 20 people visiting? Or, is my T-Mobile connection too slow? It loaded now, but it’s very slow, other websites are loading quickly. Yeah they seemed to be slammed earlier. Where did you go Charlotte/Bradley? Please do us all a favor. 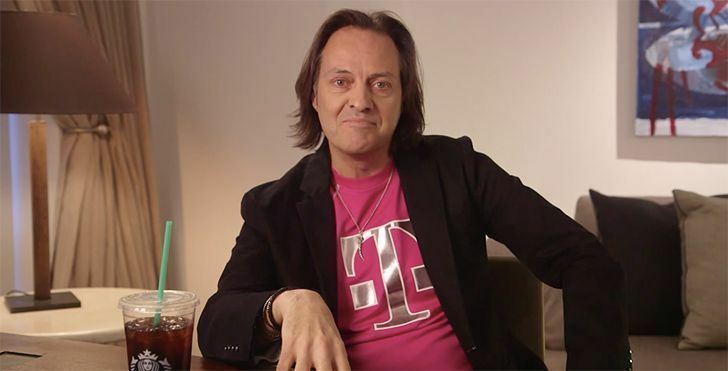 Find some different pictures of Legere to post up on your site. I am getting really sick of the same picture — with his Starbucks and his smirk — gracing the story regardless of the content. Post a picture of a T-Mo network engineer (since these are the guys doing the heavy lifting). Post a picture of your dog or hamster. Hell, post a picture of Bernie Sanders, if you really feel the need. Just please please lay off the Legere routine. I can never properly digest a meal these days, at least when I’m checking my favorite site about my favorite carrier. The news is good — but the CEO is not. So let’s focus on the good stuff. This news would not be possible without the CEO. Were the tests taking Binge On throttle and congestion throttle into consideration? These result shouldn’t matter if BingeOn was on or off. Now Verizon should of only won one award since T-Mobile had higher 4G speed. Why they consider it a tie, idk. I have no idea, I guess I have to read the report at some point. Did they turned off Binge On to do the tests? Or the testing apps are zero rated anyway? Didn’t Legere dismiss OpenSignal’s data/report at one point in the past? It looks like that while T-Mobile is still not quite Verizon in overall coverage, they are certainly within that ‘good enough’ range at this point to take a large chunk of their customers via direct competition now. I never heard of OpenSignal prior to this test. Is it one of those services that can stack the deck in their favor..? Likely, that looks like it’s the case. I visited their website and something was real strange– The map listed that T-Mobile has a tower in my back yard, and so do a few other neighbors. The reality is that T-Mobile doesn’t have coverage in the area for several city blocks. I know this because I had to get a T-Mobile 4G LTE Microcell. (Not WiFi. This is the one with the GPS unit on it; which has to be registered with the FCC). As I zoomed in, it calls into question how OpenSignal collects network coverage/speeds. Specifically in the shopping center near my home, there are several microcells which OpenSignal believes are big $250,000 T-Mobile cellular infrastructure sites. Well, now I know OpenSignal’s data is also including microcell data, and speeds based on cable or DSL which customers like myself are paying for. I suppose John Legere would love to consider my separately-billed 100Meg Cable or DSL service as “T-Mobile coverage”, a selling point for his network. The reality is that the data is wrong, and it’s a stretch of the truth. Not a truly accurate test of the network (and service) T-Mobile Natively provides without help from DSL or a Cable provider. Perhaps they’ll make some accurate ads about how fast their network is when customers also pay $75/month in high-speed internet service too..! The reality is that T-Mobile doesn’t have coverage in the area for several city blocks where I live. I know this because I had to get a T-Mobile 4G LTE Microcell. (Not WiFi. This is the one with the GPS unit on it; which has to be registered with the FCC). As I zoomed in, it calls into question how OpenSignal collects network coverage/speeds. Specifically in the shopping center near my home, there are several microcells which OpenSignal believes are big $250,000 T-Mobile cellular infrastructure sites. This is all awesome except the 3G lie. T-Mo calls their 3G tiers 4G, HSPA and HSPA+, so that they can cut you off from them once you reach your high speed data limit (if you have one). They don’t have any more 3G that I can find anywhere, I get stuck on EDGE every time I go over, which if we’re being honest, should be considered T-Mo’s 3G if they want to label HSPA 4G. So no, T-Mo has some of the slowest speeds on 3G in my opinion. Still though, I’m happy they scored well in other places since that one gripe, while annoying, isn’t enough to get me to switch away (especially now that I’ve had the 10GB/mo plan since July and don’t go over anymore). I’m afraid that the 3G HSPA spectrum has been refarmed to LTE more than the 2G EDGE one, in my experience. The result is that, instead of falling back into something that apps are happy with, 3G, with a faint LTE signal the phone falls back into 2G, which results in time outs more often than not. I don’t get anywhere these speeds in West Chester,PA 19380. Just clicked in at a whopping 1.36 Mbps download and 2.23 Mbps upload. Says its on LTE. It’s sort of funny TMO disavowed OpenSourse results about 18 months ago as not being an accurate measure of LTE. I get 19mbps 3G, and 26mbps LTE at my residence. The data works so well at my house and side of town when I try to do a opensignal test there it fails.